Reubens are one of my Hubby’s favorite sandwiches. I typically don’t order them when we are out on account of my neutral feelings on sauerkraut. I made these for him, but I also really liked them! 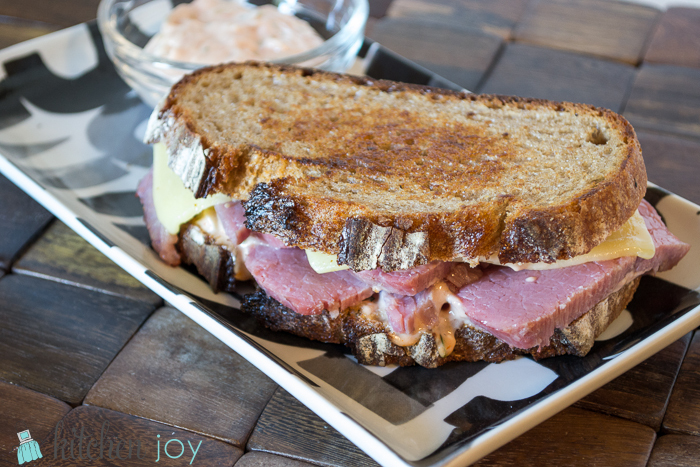 My favorite Reuben I’ve ever eaten, and really easy! The homemade Russian dressing was simple to make, and tasted excellent. I will be making it again for other uses, I’m sure. We’re having a sort of “Sandwich Hall of Fame” menu around here this week, so hopefully you like sandwiches as much as we do! Sprinkle the corned beef with a little water, wrap it tightly in aluminum foil and steam it in the oven. Meanwhile, put the whole loaf of rye bread (unwrapped) into the oven. Bake the bread until the crust is very crunchy, about 15 minutes. Set the bread on the counter and let it cool for about 5 minutes. When the rye bread is cool enough to handle place it on a cutting board. Hold the bread knife at a 45-degree angle and cut 12 slices. Take the corned beef out of the oven and unwrap it. Spread each slice of bread with Russian dressing. Layer half of the slices with corned beef, sauerkraut and slices of Swiss cheese, then top the sandwiches with the remaining slices of bread (dressing-side down). Heat 2 large heavy skillets over medium heat. Brush the bread with butter. Put the sandwiches in the pans and weight them with a lid or heat proof bowl topped with something heavy. Cook until the first sides are crisp and golden about 7 minutes then flip the sandwiches. Cook until the second sides are also well toasted and the cheese is melted. Lift the sandwiches onto a cutting board. Cut each in half diagonally and serve. Note: Buy high quality corned beef for this recipe. Avoid corned beef that is very lean.